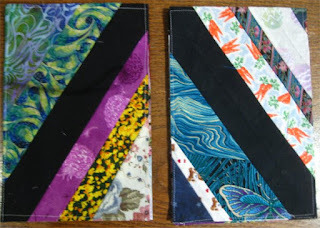 In addition to my machine piecing and longarm quilting, I also like to have a handwork project going on. This is typically something that I take along with me in the car or on trips, just so I have something constructive to do with my hands. It was sometime in April (I think) that I got this cute throw pillow pattern. It caught my attention because of the vintage trailer design ... and Mr. Pirate had just purchased a new-to-us travel trailer. I thought it would look adorable, gracing the interior of the trailer. The pattern is called "Happy Camper" from This & That. I didn't realize that it would actually be *practical*, too! This trailer is small, only 17'. There isn't a whole lot of excess room inside, but it's exactly the right size for 2 people. When we are watching a movie on the laptop, in the trailer, we put the laptop on the stove, facing the dining table. We each sit on one of the benches, lengthwise, so that we face the stove and stretch our legs out. As it turned out, sitting this way was a little uncomfortable on my back, as there was no cushion on the narrow end of the bench seat against the wall. I hand embroidered the design, using a back-stitch and 3 plies of DMC floss. I put a thin layer of batting under the embroidery fabric and stitched through both layers. 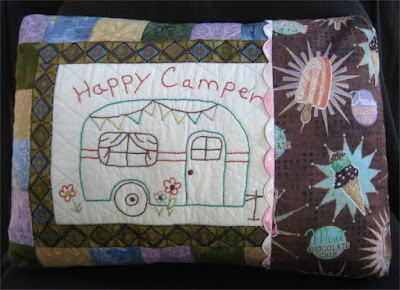 When finished with the embroidery, I quilted a diagonal cross-hatch around the trailer. The trailer itself got a stitch in the ditch. 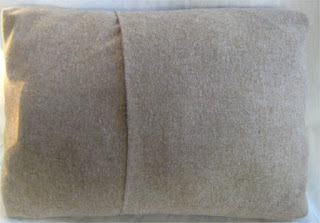 I was able to use fabric from my scrap bins to create the front and back of the pillow. The pattern design calls for 3 covered buttons to be sewn on the right-side panel, but I knew they would annoy my back, so I omitted them. The little scallop trim came from my mother-in-law's stash, so it is *truly* vintage! it. But in a departure from that normal procedure, I used an overlapped backing. The next victim of my UFO rampage is a "strings" quilt. I originally started these blocks in 2006. 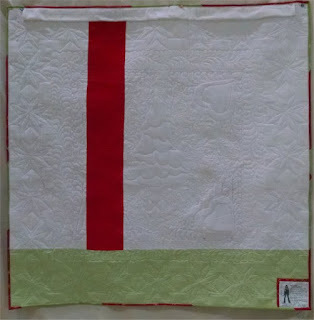 The pattern was provided by an About.com Quilting forum member, Becky in Suriname. At that time, I made 40 blocks and then put the project away. The reason? I haven't a clue. Maybe I got bored with the block construction. It certainly is mindless sewing .. and if you need to do sewing of that sort, this is the block to do! In any case, I definitely needed to make more blocks. this is a block "set"
The block is 6"x9", certainly an oddball size. The reason why it's *that* size is because I remember going through my stash and pulling all the thinner, plain cottons and polycottons. A 6x9 block was the biggest I could cut out of one of the pieces, so that became the size of the foundation fabric. For this pattern, it really does NOT matter what size your block is ... just that all the blocks are the same size. This particular pattern calls for 8 blocks in a row ... 4 sets of 2 blocks each and you need to make sure that the black diagonals oppose each other! Then a total of 8 rows creates the major part of the quilt. When it came to sewing the blocks (and then the rows) together, theoretically, all those black strips in the middle are *supposed* to meet up and form perfect diamond. Yeah, like that really happens. It became obvious that I wasn't being OCD-careful in the placement of the central black strip because, in several cases, those black strips most definitely did NOT meet up nicely. There are quite a few intersections where there are jagged seams. And I really am not going to be concerned about it. This is not an heirloom quilt. This is a quilt be used, hopefully for a long time, and as long as it gives warmth and comfort and a degree of love to the recipient, then I am going to be pleased. Life is just too short to be too focused on creating a perfect masterpiece every time. Besides, I have a messload of other UFOs to get to work on! There were 40 blocks already sewn when I picked the bag out of the UFO bin; that's 5 rows. I needed to sew 3 more rows; 3 rows x 8 blocks/row = 24 rows. I started sewing the additional 24 blocks on 5/11/16. After all the blocks were sewn and stitched together, I sewed on a narrow black border, to give your eyes a rest from the busy-ness of the interior. A piano key border was next. This one was extra wide, at 6", but I had quite a few strips of pre-cuts that were 6" wide .. so that's why the piano key border is that width. I varied the size of the individual segments to give some variety and finished off the corners with another sew-n-flip square. I finished the piano key border on 5/13/2016. And ya know? My stash of scraps does not seem diminished in any way. How can I have possibly used up 15 million scraps and not see any appreciable decrease? It truly is one of the Great Mysteries of the Universe. Do you know what this is? Of course you do. 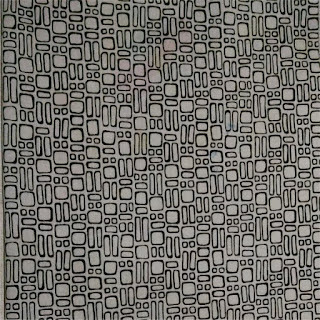 It's a graphic black and white printed fabric. 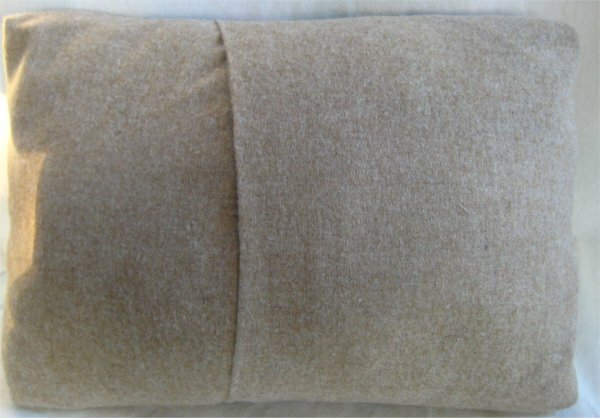 Very basic; we've all seen and used this kind of fabric before. Recently, I attended a local quilt show, put on by a local guild (to which I do not belong). Pati Fried was the featured artist. I was fortunate to catch her in a lull in the show and she waxed eloquent about a fun idea involving color markers and fabric. In one of her recent blog entries, she posted, " .... I will be playing with color all weekend at the show. My whole shtick has always been to inspire others to try something new. So, that is going to be the theme of the weekend from me. I will be sharing tips and tricks on how to add color to all of those wonderful black and white prints on the market today, and then show a few samples of what to do with them! ... "
She talked about how she uses the graphic black and white *fabrics* as coloring books! She uses fabric markers and coloring crayons, both heat set, to transform the black and white into technicolor! The effect was astounding. What was once merely an attractive and useful graphic was now blazing with custom colored designs. I couldn't wait to get home to try it! From my scrapbooking and card making craft supplies, I knew I had markers, pencils and perhaps even crayons. I knew that I also had some specific *fabric* markers but I was curious to see if any of the other markers would be suitable. 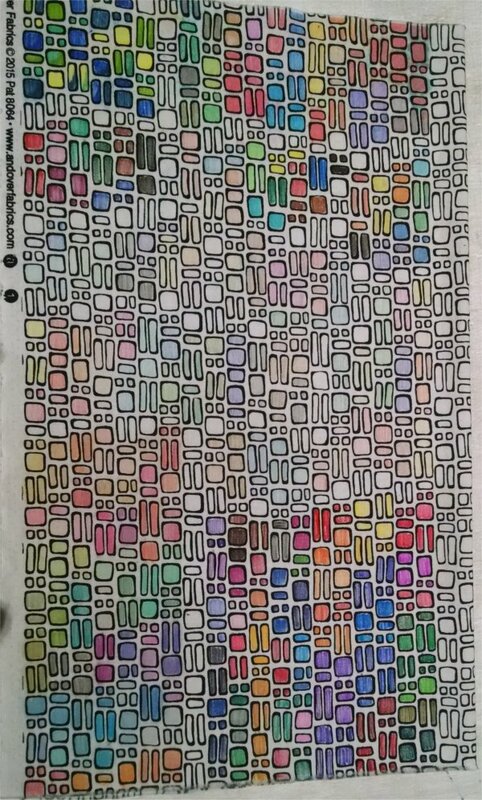 The only problem was that many of my markers are quite old; they could even be dried out, for all I knew. A purchase of new markers was in order.. but ... just in case I didn't care for the process, I didn't want to buy expensive ones but did want ones that would color nicely. From my local Aaron Brothers Art Mart, I ended up purchasing a couple of individual (apparently high end) Winsor & Newton markers and at the other end of the scale, some inexpensive, generic children's markers. As was to be expected, the regular pencils were the lightest ... but they still didn't wash out! Even the watercolor pencils didn't wash out. The section that looks very pale and washed out (in the middle) is the areas where I used the watercolor pencils and the regular colored pencils. So, if you wanted a very toned-down, subtle hint of color, you can achieve this effect but simply using pencils. The best turned out to be *both* the most *and* least expensive: Winsor & Newton markers AND the Art Alternatives. Those colors are vibrant and rich. 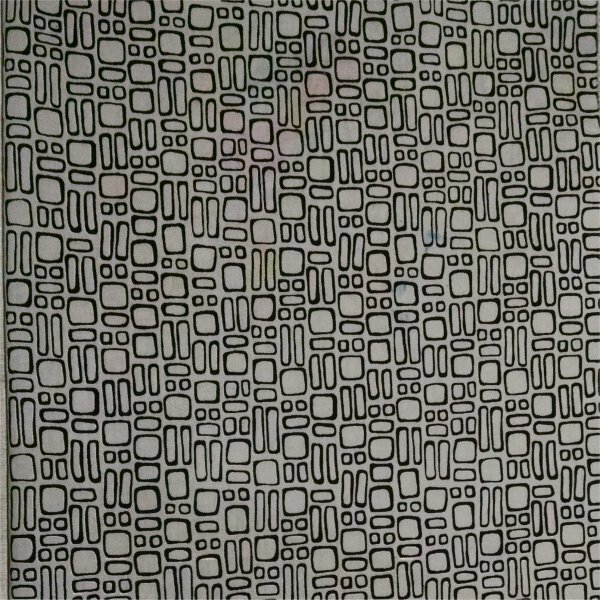 The boldly colored areas at the top and bottom of the fabric are the areas where I used these markers. So, now that I had some colored fabric that I knew would withstand laundering, I decided to make a zip pouch. I love zip pouches ... they are SUCH fun to make. I cut this colored fabric to use *just* the colored-in areas. This dictated the size of my zip pouch. I found some colorful, irregularly striped fabric that I used as the interior lining and a suitably long zipper in a greenish teal shade that I knew I was never going to use any place else. I have a fairly large collection of instructions/tutorials for making zip pouches of different shapes. They are all such fun to make! 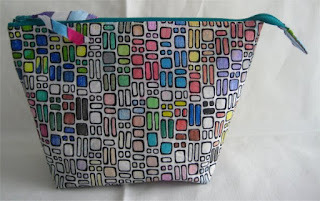 But, my *all time FAVORITE* tutorial is Anna of Noodlehead's tutorial for her Open Wide Zippered Pouch. By far, I believe this is the BEST basic zippered pouch EVER. Why? Simply because, as it's name says, it's "wide open". Because Anna leaves a zipper tape tail that extends past the pouch itself, you are able to open the pouch as wide as the fabric will allow. 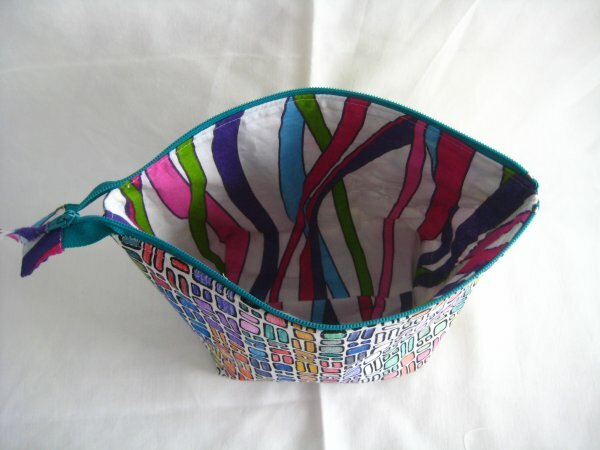 You have access to the entire interior of the pouch. Other zipper applications don't allow for the pouch to be fully opened. See how open the pouch can be? If the zipper had stopped at the ends of the pouch, you would have had a much *smaller* opening and your access to the inside would be restricted. I oriented the fabric so the bold, dark colors were at the top and the paler areas were at the bottom. Because this pouch has boxed corners, which gives you a flat bottom, the pouch can stand up on its own (given proper interfacing). The boxed corners do take up a fair bit of fabric real estate, i.e. 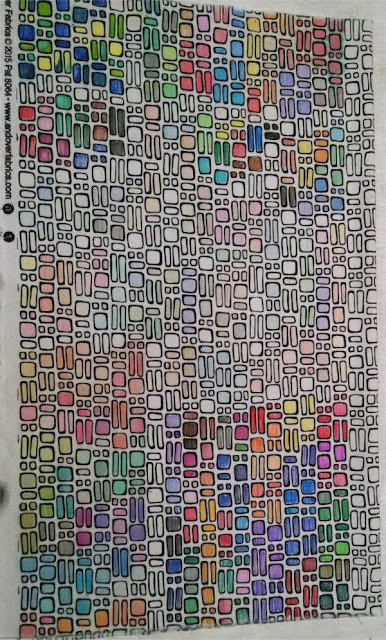 you do lose some of the pattern to being on the bottom, but in this case, it was quite OK with me, since that was where the less interesting, paler colors were. Digging around in my black & white stash to see what other graphic prints I might already have. I discovered several candidates that might work out nicely. Seven, in fact. The hexagons, squares and checkerboard will absolutely work out well. The zebra stripe might work .. or it might not. The roller coaster and cat outlines might not. The text print has circles that could be colored in. However, these 2 black and white prints won't work at all; there's just nothing to color. TA DA! I'm so doggone pleased with myself! :-) From being in a UFO bin since late 2014, I pulled this project out into the light of day late April 2016 and it is completely FINISHED as of May 6, 2016! I mean .. labeled and bound! Woo hoo! You can read about the first post here. But, she did like the look, so I proceeded with needleturn applique of the Christmas tree and some hand embroidery embellishments ... fly stitch along the lower "branches", a metallic swag and some bright shiney flowers. For the quilting, all of the sawtooth stars and the Christmas tree got stitched in the ditch. It just takes a LONG time to do that sort of outline stitching on a longarm. Be aware that if you ask your longarm for stitch in the ditch, you're going to pay for it. Literally. As I look at the photo of the finished front, I see that I STILL FORGOT the Christmas tree topper! Sheesh! 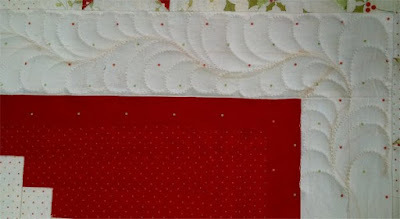 The float border was quilted in undulating feathers. The red part of the log cabin blocks got hearts with feathers around the outside. The white part of the log cabin blocks (which forms the background for the Christmas tree) got a clamshell filler that flattened that part of the quilt, allowing the Christmas tree to puff up a bit. 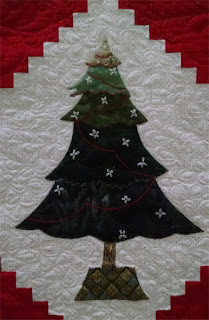 Because the Christmas tree is a fairly large expanse of fabric, I also quilted a swag line inside the tree. 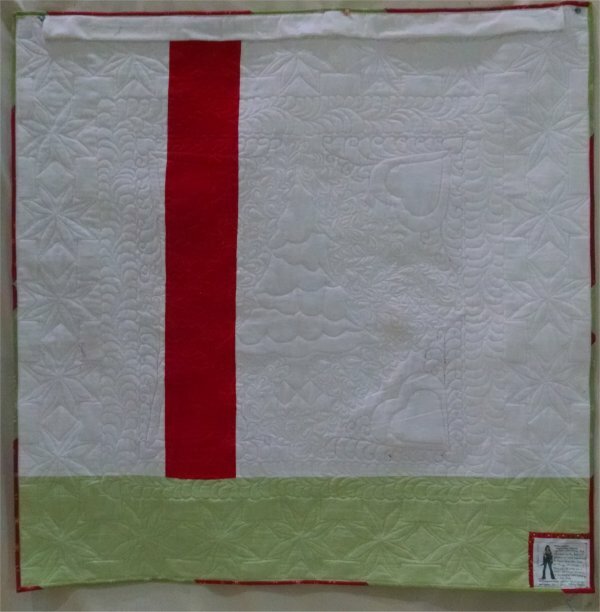 The next project I pulled out of my UFO bins was a small (42" square) quilt/wall-hanging. 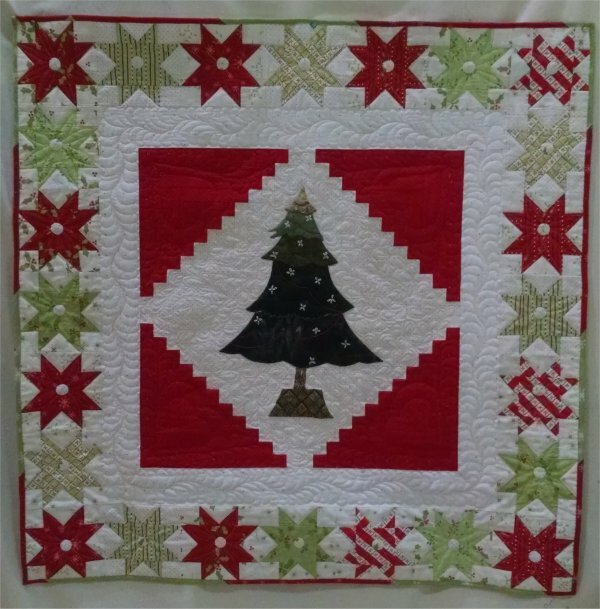 The pattern is from a Leisure Arts booklet, "Christmas Sparkle" by Mary Jane Carey of Holly Hill Quilt Designs. Back in 2014, I bought the booklet, a fat quarter pack and some coordinating yardage to make the cover quilt. Everything languished in a holding pattern until now. 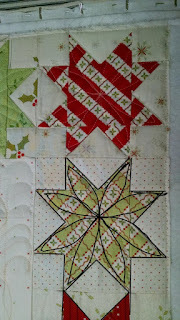 This is an incredibly simple, easy pattern to make ... a whole bunch of sawtooth stars around the perimeter, an inner border, and a BIG log cabin interior that serves as the background for an appliqued Christmas tree. Honestly, it took me 4 days of sporadic piecing to get the top done. It's just that easy. I was able to find some sizeable flannel pieces that I sewed together in a big color blocked layout for the backing. I was able to piece an oddball sized batting piece to a more useable shape. Today, 4/30/2016, I started the quilting. 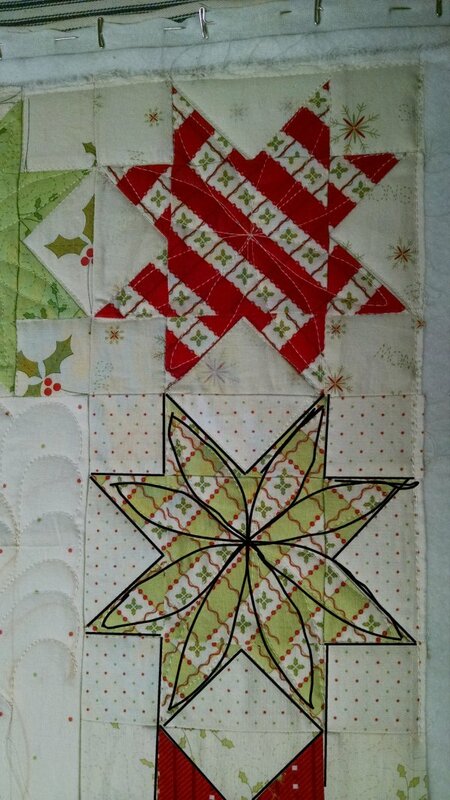 I'm outline quilting the sawtooth stars and doing a loopy design in the middle of the stars. I was pleased to find a continuous thread pathway so I could stitch the outline and loopy interior without starting and stopping. If there's one thing I just detest about longarm quilting, it's designs that have a lot of starts and stops. 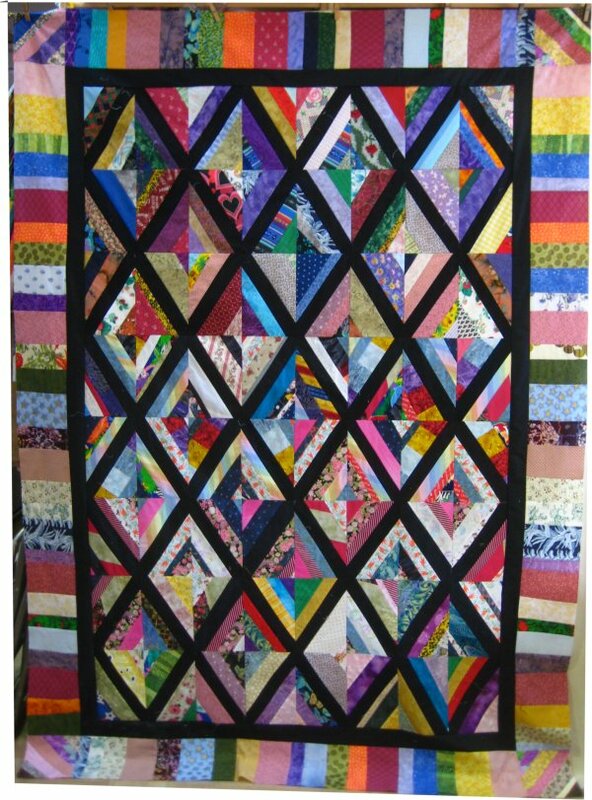 In the photo to the side, I've drawn in the quilting design on the sawtooth star in black. My original plan was to quilt continuous curves (aka Orange Peel) in the background fabric of the stars, but once I actually quilted the stars, I realized this would put a LOT of thread down. 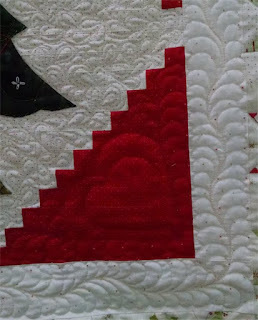 More thread = a stiffer quilt ... and that is exactly what I do NOT want. So ... the continuous curve quilting was eliminated. The inner border gets an undulating feather design. I've chalked in the corner curves and the spine itself. For me, the placement of the spine is very important. Most of the time, I want uniform, symmetrical feathers on either side of the spine and if you get the spine placed weirdly, you get weird feathers. You can see the chalked in corners and spine in this photo, but the chalk will wash out.